The Making Dads book is based on the third annual Making Dads Summit. 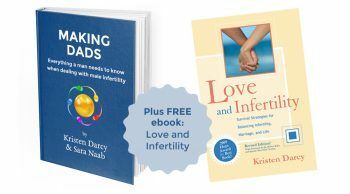 Fertility coach Kristen Darcy and co-host Sara Naab, Co-founder, Marketing and Quality Director at Sandstone Diagnostics, the makers of Trak, bring together more than twenty experts in the field of male fertility. The Making Dads book is based on the third annual Making Dads Summit. Fertility coach Kristen Darcy and co-host Sara Naab, Co-founder, Marketing and Quality Director at Sandstone Diagnostics, the makers of Trak, bring together more than twenty experts in the field of male fertility: renowned doctors, distinguished psychologists, an exceptional lawyer, and the brave men who suffer with fertility struggles to discuss the latest research, steps to take, and coping strategies. While most fertility sources focus on only one method or strategy, Making Dads Summit explores the current thinking on many aspects of the often puzzling and misunderstood subject of male fertility. style, punctuated by humor and high spirits, Making Dads ebook offers in-depth research, camaraderie, and hope. FREE GIFT: If you purchase during National Infertility Awareness Week (NIAW 23rd – 29th 2017), you’ll automatically receive the “Love & Infertility” ebook for free.